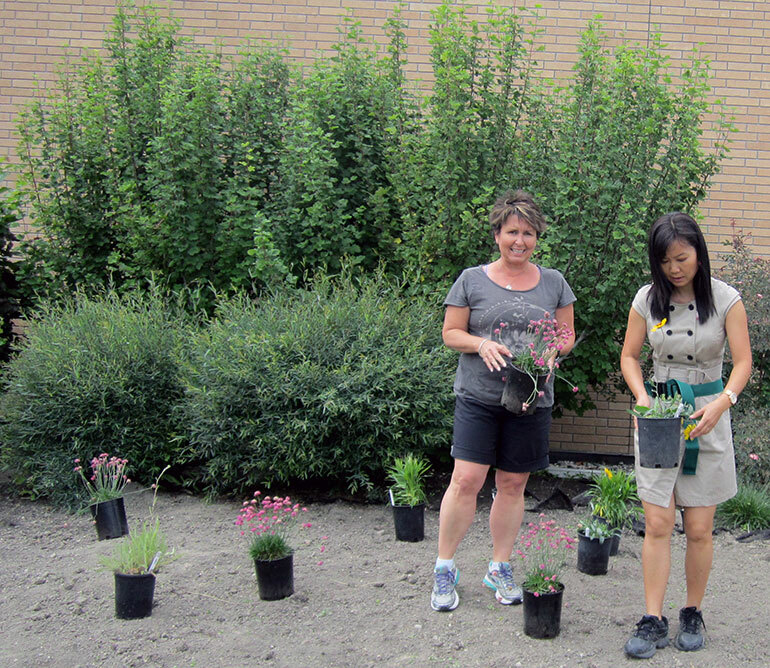 Garden Club members Krista Stokell (left) and Jennifer Ma get ready to plant at the south-side plant bed of the Reichwald Health Sciences Centre. Nectar trails have been creating a lot of buzz in the community. Earlier this year, Border Free Bees planted a 7.4 km nectar trail in Kelowna’s lower mission area with the goal of creating habitat for bees, birds, and other pollinating species. Now a nectar trail has taken root on campus. On June 16, members of the UBC Okanagan Gardening Club set out on a mission: to support wild pollinator populations on campus and have fun while doing it. Supplied with tools and a selection of plants that they chose themselves, the Gardening Club teamed up with United Landscapes staff to plant a nectar trail along Discovery Avenue. If you’d like to see what the buzz is all about, you can walk the nectar trail now and enjoy the many plants that are already in full bloom. The trail begins at the plant beds outside the Reichwald Health Sciences Building and ends at the Cassiar residence at the top of Discovery Avenue. Keep an eye out for Gardening Club signs as well as any passing pollinators! The planting season is winding down, but the Gardening Club will continue to meet over the summer, with workshops on the second Thursday of every month from now until October. These lunch-and-learn style workshops, hosted by faculty and community experts, are open to all students, faculty, and staff, and will give you tips and tricks that you can take home to your own garden. Details will be announced shortly. For more information, contact Natalie Ingram (Natalie.ingram@ubc.ca). In addition to the workshops run on campus, there are still spaces available in the upcoming workshop at Lee Valley’s Kelowna store to build birdhouses on Thursday, June 22. The finished houses will be donated to the university for installation along the nectar trail and other locations on campus. A picture of the Reichwald Health Sciences Centre South-side Plant Bed, which Gardening Club members Maureen David designed and Casey Hamilton planted.